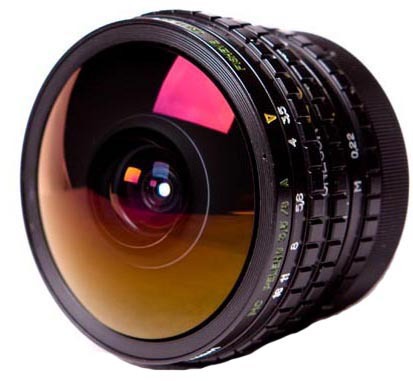 The Peleng 8mm Fisheye for Nikon is a rare circular fisheye lens created by the Belarus company Peleng. It sports zero electronic elements so there is no AF and the aperture has to be changed directly on the lens. Your camera will show only an f/0.0 setting, which is normal. The front element of this lens bulges out and is vulnerable to scratches so be careful - especially since the original cap does not fit securely. The outer barrel is made of metal so it is rugged and suitable for outdoor use. When you manually stop down this lens, your scene will appear darker in the viewfinder. To combat this during composition there is a lock/unlock ring to switch from a wide open f/3.5 view to whatever aperture you want to actually use as set by the aperture ring. You can unlock it to frame the shot (brighter in viewfinder), then lock it to take the picture. This lens is ideal for experimentation, landscapes, architecture, and urban scenes. • This fisheye accepts rear gelatin filters. • This lens is compatible with both full frame and crop frame sensor cameras but will show as a complete circle on full frame cameras whereas crop frame cameras may show dark/chopped corners.